Tumblr Speak is a mixture of Standard English (SE) and non-SE features. The non-SE features of Tumblr Speak appear to differ from SE in a number of ways, including elements of syntax, morphology, semantics, and orthography. For example, the SE construction because of X is sometimes found in Tumblr Speak as because X, where the preposition of is omitted. So in Tumblr Speak a phrase such as because of America is sometimes written as because America. Tumblr Speak also contains borrowings from other languages. For example, the French definite article le is placed before some SE words, creating terms such as le sigh and le kissing, where le does not appear to have any real semantic meaning here. Another example is the phrase me gusta (‘it pleases me’), which Tumblr Speak has borrowed from Spanish, along with its negative form no me gusta (‘it does not please me’). Tumblr Speak has also derived new words and expressions, with their own unique spellings and semantic meanings, from SE words and expressions. For example, Tumblr Speak has taken the sentences I am sorry and I am not sorry to create the term sorrynotsorry, which acts as an ‘insincere apology’ where the user is sorry but at the same time they are also not sorry for something they have done. Another example is stahp, a Tumblr Speak word that has derived from the SE word stop. Stahp has not only changed in spelling but also meaning, as it tends to be used as a compliment: ‘you are so perfect, please stop being so perfect’. Tumblr Speak has also taken a number of terms and phrases from TV shows and movies and incorporated them into the lexicon. For example, the movie Mean Girls, which is set in an American high school, has a scene where Santa comes to the classrooms to give out candy canes. 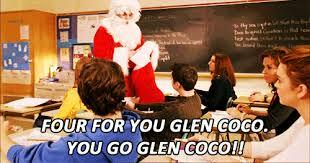 One of the students is called Glen Coco, and Santa gives him four candy canes saying “Four for you Glen Coco, you go Glen Coco”. Interpreting this line of dialogue as some sort of silly compliment, Tumblr Speak has taken the four for you part and now uses it as a show of praise, similar to well done or the Australian good on you. These are just a small selection of the interesting features of Tumblr Speak. There are of course many more. New features appear all the time, making this variety of English a fascinating topic of study. * Jennifer Oxley is a research assistant at the ANDC. This entry was posted in new words, popular culture, social media and tagged four for you, good on you, le kissing, le sigh, me gusta, no me gusta, sorrynotsorry, stahp, tumblr, you go Glen Coco by Mark Gwynn. Bookmark the permalink. As you probably know by now, the American Dialect Society has made because NOUN its Word Of The Year for 2013. Interesting article. I disagree with some of the definitions.